Mail4Rosey: King of Christmas has a Giveaway! For over a decade, King of Christmas has been bringing joy and happiness to homes all across America in the form of Christmas Trees and Wreaths. The easy-to-assemble, easy-to-care for Christmas trees range in size from 5ft. - 12 ft. and beyond. You can get a tree that is lit, unlit, or LED. The site also has tips for assembling, caring for, and properly storing artificial christmas trees to ensure optimum quality and life. Right now King of Christmas also has a great giveaway going on. First prize is a King of Christmas Cyprus Spruce Christmas Tree ($279 value). Pre-lit with LED lights, this tree will ensure holiday decorating is beautiful, and a breeze! And the Third Prize in the giveaway is a $50 Apple Gift Card. You can enter to win any of the great prizes above by visiting The King of Christmas website. Giveaway ends December 6, 2013. Wow these are just lovely giveaways! I'll be sure to share them too! I have an artificial tree. It's waning. I just shove it in the box as kindly as I can. Thanks for sharing these Rosey. Those are pretty awesome prizes for the giveaway I must admit! We don't put up Christmas trees anymore and I personally can't stand Apple products. I think I'll let someone else have a shot at these. I remember you saying that last year and I was in awe! I am not sure I could do it. I bet your kids will always remember that and think of how awesome it was of you. Great giveaways! I can't have a real tree, I'm allergic :) Which is ironic since I grew up in WA state surrounded by pine trees. My eyes swelled shut one year though and that was the end of the real trees for Christmas! Having your eyes swell shut would be awful!! I hope that didn't last too long! I usually do not enter giveaways but have decided this year to enter every one I find! Thank you for sharing. I think the giveaways are fun. :) Good luck rounding up the prizes! I'm thinking the ease of an artificial tree would be awesome! We got rid of the artificial tree we had owned for years before our last move because the box was falling apart and we wanted to get back to using real trees. Two years of real trees and real pine needles all over my living room, daily sessions of crawling under the tree to water it, and hours wasted each year trying to find a tree that was perfect from all angles, we've decided to go back to artificial this year. Fingers crossed we win! Our artificial tree has seen better days. It's definitely time for a replacement. What a great giveaway, I love everything about Christmas. Love the tress! I love those trees too....and everything about Christmas. :) Thanks for the visit! What a great giveaway they are sponsoring! We always have had fake trees. ,y grandpa was a firefighter and this was always his busy season. So many people forgetting to water the trees and they dry out. Hot lights set the on fire. Those stories always scared me enough to never try a real tree! They are giving away something magical to a special someone. Thanks for sharing! I agree, those prizes all could make someone's Christmas fab. That is one giveaway I need to enter. I need a new Christmas tree but the hubby thinks we need to wait till after Christmas to get a good bargain. This is a great giveaway, I entered it earlier today. My poor worn out tree needs to be replaced. Now that the kids are older, we might be able to do a simpler tree with just a few ornaments. I would love to win the tree! We don't have one yet. I like that tree because it's pre-lit. The lights are the hardest part to get right, I think. :) Thanks for the visit! Those are some awesome giveaway prizes! I would love that large pre-lit tree! I think they are so beautiful! Those prizes really are great, I agree. :) Thanks for visiting, Amber. I gave my tree to my Granddaughter so I am in need of one. Maybe I will get lucky and win it. I am going to enter the giveaway. I had to get rid of my last tree because the lights stopped working so I have been in the market for a new one. It would be great to win one!! This looks like a great giveaway. 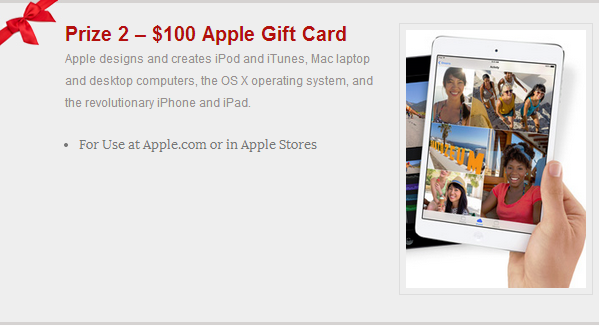 My daughter would love those apple gift cards. Since we lost most of our house because of the storm, I'm not sure if we're going to get a tree this year. Fantastic Giveaways!! I love a good giveaway! :) We do an artificial tree but in the back of my mind I've always thought about getting the real deal. Maybe one day we will! Wow those are some really great giveaways. I'm loving prize #1 and 2 the most. I always get my daughter an apple gift card for birthdays and christmas. I haven't thought to give Apple Store cards, but it surely would be well-received, I'm sure. I thought they were great too! Thanks for the visit. That is a beautiful Christmas tree. Great giveaway all the way around. I entered! Thanks for stopping over, Pam! I would love to win the tree! This year money is so tight that I have to choose gifts or a tree and with my 1 & 3 yr old I have to get them some gifts. This would be awesome to win! Giveaways are super great this time of year! I'm sorry to hear about your mom, Courtney!! This is a great giveaway. I have been looking into getting wreaths for the doors in our home and this sounds like a great place to get them and to get a great tree for Christmas.